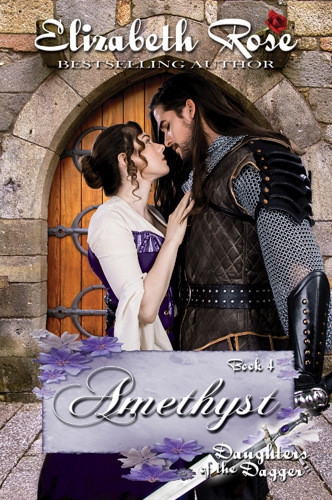 Amethyst is sent by the archbishop to assist her uncle, the Master Mason, building a castle for the infamous border lord, Earl Marcus Montclair. Amethyst de Burgh felt like she’d died and gone to Heaven. There before her was the most beautiful site she’d ever seen. A castle being built. A glorious fortress rising up into the sky, and under construction right in front of her. She sat tall upon her horse and just gasped at the amazing site. Many workers scurried about busily. Some pushed wheelbarrows filled with mortar up ramps that led to high scaffolds attached to the stone walls, all the way up to the tops of the towers at each outer corner. Other workers were atop the battlements using hoists and pulleys to lift the woven baskets filled with supplies that the peasant women attached from below. The clinking sound of the masons’ chisels splitting the stones, and hammering noise of the carpenters, echoed through the crisp autumn air. Piles of rocks and rubble were everywhere. Men with two-handled saws were cutting fallen trees, preparing the boards that would be used for some of the roofs as well as the floors within the castle. The village lay outside the castle’s walls, where the little huts of wattle and daub were being used as temporary residences for the workers. An open area that she knew would eventually be the site of a barbican or gatehouse, was surrounded by partially built walls of the castle’s outer curtain. She rode forward, surveying the situation. Just beyond the outer ward was an area for a second gatehouse, and also a drawbridge over a dry ditch leading up to the main gate of the castle. There was no water in the moat yet, and she knew sometimes moats were left dry and instead, pointed spears were inserted and used to fend off attackers. The dirt from the moat had been used to form a hill on which the keep of the castle was built, and she could see that the stone from the ditch was being mined and mortared together to construct the thick and sturdy fortress walls. She rode over the drawbridge and through the castle gate. It opened into a bailey, or courtyard of the castle. Buildings were being constructed for the blacksmith, the stables, the kennels and also the mews, among others. And in an alcove with a partial wall of protection being erected around it, was the very important well. The borderlands of Northumberland were rustic and rural. There was nothing but rolling hills and dots of forests for as far as the eye could see. She’d traveled for many days with her escorts over the uninhabited lands, after leaving the wedding of her twin sister, Amber, in Canterbury. And now, by the orders of the archbishop of Canterbury, she had in her pouch a missive stamped with the archbishop’s own seal in wax, that stated she would be involved in this wonderful project. Her head whipped around to see her uncle, Clement, the master mason in charge of building the castle, standing in the distance. He had a group of men gathered around him as he instructed them, and a piece of parchment with plans for the castle unrolled and held up in front of him for the workers to see. He was her late mother’s only sibling, and she remembered him well from the year she’d spent traveling with him four years ago watching him at his trade. She’d been enthusiastic to learn all she could of castle building then, and even more so now at her age of eight and ten years. Her uncle took a special liking to her, out of the four sisters, and always wrote her, telling her everything he was doing where building was concerned. And Amethyst always wrote back, asking many questions and learning as much as she could. “Uncle Clement!” She jumped from her horse before the guards could even help her dismount, and picked up her skirts and ran over the dusty ground, making her way to her uncle. She threw herself into his arms and they hugged. “Thank you, Lady Amethyst,” said one, and the other nodded as well. They did as she ordered and were on their way. “You make no sense.” Clement took a swig of wine and handed the flask back to her. “Oh, now no one can be that hardened,” said Amethyst with a shake of her head. “Master Mason!” came a loud bellow from behind them. Her uncle turned quickly and then looked back to her and shook his head.